Students at Washington University in St. Louis have built a robotic prosthetic arm for thirteen-year-old Sydney Kendall. Kendall Gretsch, Henry Lather, and Kranti Peddada are seniors studying biomedical engineering in the School of Engineering and Applied Science. Sydney Kendall is a 13-year-old girl who had tragically lost her arm seven years ago in a boating accident. Her only request for her prosthetic limb was for it to be in pink. 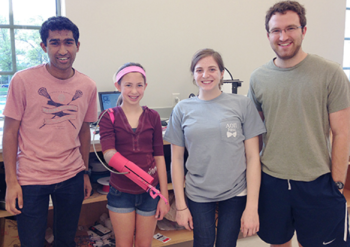 The students set to work to create a 3D printed prosthetic arm that was not only pink, but was also robotic. The robotic arm has a motor, as well as a working thumb – which sets it apart from other 3D printed prosthetic arms available today. Using a computer program and a 3D printer, the students printed a robotic prosthetic arm in about 13 hours. The total cost was around $200, saving Sydney’s family over $5000. The students had developed the robotic prosthetic as part of their course in engineering design alongside their professor Joseph Klaesner and several other medical practitioners. Hand surgeon Charles A. Goldfarb says that the project was a valuable experience. “They brought their engineering expertise, and we shared our practical experience with prosthetics and the needs of children,” he said while speaking of the students, none of which had any previous experience 3D printing prosthetics. As for Sydney, with her new 3D printed arm, she is now able to throw balls as directed by her arm thanks to the robotic portion of the prosthesis. The students add that it was a thrilling experience to see Sydney use her arm for the first time.